Harris, J., Hofer, M., Blanchard, M., Grandgenett, N., Schmidt, D., van Olphen, M. & Young, C. (2010). “Grounded” Technology Integration: Instructional Planning Using Curriculum-Based Activity Type Taxonomies. 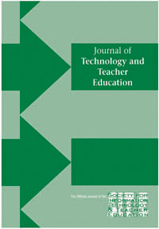 Journal of Technology and Teacher Education, 18 (4), 573-605. Waynesville, NC USA: Society for Information Technology & Teacher Education. Retrieved April 19, 2019 from https://www.learntechlib.org/primary/p/30418/.